Authorised retailer for 88 Rue du Rhone Watches. Free delivery, 30 day free returns and five-star rated service. Buy now with up to 12 months 0% finance. 88 Rue du Rhone are a young watch manufacturer who have only been around since 2012. Their first collection was exclusively launched in July 2012 at Selfridges in Oxford Street, London. But don't mistake the brands age for inexperience! The company was founded by Ellie and Pierre Bernheim, whose family has a history of luxury watchmaking. 88 Rue du Rhone watches made a successful début at Baselworld in 2013 receiving universal acclaim from journalists attending. 88 Rue du Rhone watches are Swiss made and available in over 40 countries including the United Kingdom, United States and Switzerland. Their brand has grown in stature thanks to their reputation for high quality Swiss made watches at affordable prices. This has made them popular, especially with younger people who want high quality luxury watches without breaking the budget. 88 Rue du Rhone watches are available in both a mens collection and a ladies collection. The wide range of styles mean that there is something to suit every luxury watch aficionado! 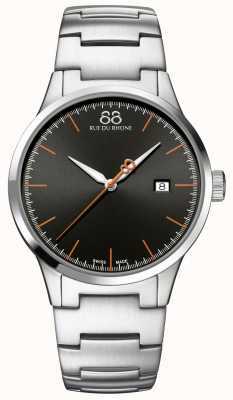 Best of all, most of the watches in the collection are available for a price between £275 and £800. As 88 Rue du Rhone's founders are big fans of the cinema, they have chosen to get involved in partnerships with big cinematic events. They became the Official Watch and Timing partner for the British Academy of Film and Television Arts in 2013. Rue du Rhone produced 50 limited edition watches that same year to commemorate the 2013 BAFTA Awards. They have since become the Official Watch Partner for the Miami International Film Festival and the Geneva International Film Festival.